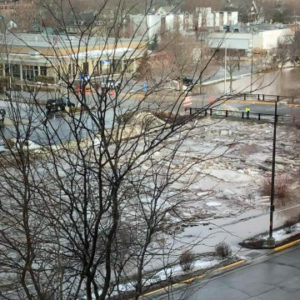 Huge chunks of ice bottle-necked at bridges in Fond du Lac causing water in the Fond du Lac River to overflow its banks and flood portions of the city early Thursday morning. Troy Haase is the Division Chief for the City’s Fire and Rescue Department. He says they had to evacuate a huge apartment complex, the YMCA and homes on Elm and South Street. Meanwhile heavy equipment was being used to remove ice from the river near the 2nd Street Bridge. Residents that had to be evacuated from their homes were sent to the Recreation and Expo Centers at the Fond du Lac County Fairgrounds with plans to relocate the shelter to the Community Church. Fond du Lac County Emergency Management activated it’s 2-1-1 service for people who needed to call for assistance. Central and northern Wisconsin schools are now struggling to make up snow days as the record breaking winter rolls on. O’Donnell says they’re dropping staff days from the calendar to make up. Some districts are adding days to the end of the year or even considering cutting into spring break. O’Donnell says Stevens Point isn’t there yet, but they will be discussing plans for make up days at a upcoming school board meeting. Investigators are getting a picture of what led to a massive pile up on I-94 nears Osseo. Conditions were deteriorating at the time of the pile up shortly after noon Sunday. Lieutenant Les Melsna with the Wisconsin State Patrol in Eau Claire says it was icy. “You can go 60, 70 miles an hour on ice, until you have to steer or hit your brakes, and then the party’s over,” Melsna said. Travel across much of the state is hazardous again today. “Don’t go out there if you don’t have to, and if you have to, you really have to give yourself that following distance, you have to reduce your speed,” Melsna said. Seven semi-trucks and more than two dozen other vehicles were involved Sunday. One person was critically injured and seven others required medical treatment. The mild temperatures we’ve had over the weekend are giving way to seasonable cold, which could be a problem to the far north. National Weather Service meteorologist Roy Eckberd says it’ll be more than just slick, foggy roads in northern Wisconsin. “Significant ice accumulations, from generally Tomahawk and Wausaukee on northward, where we’re looking for a quarter to a half inch of ice. That amount of ice can bring down small trees and power lines, and Eckberd says there’s likely to be scattered power outages. Don’t travel unless you have to in the affected areas. Check http://511wi.gov for current road conditions. 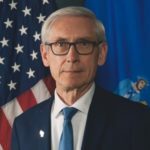 Wisconsin Governor Tony Evers has declared a State of Emergency. In the wake of a winter storm that brought significant snowfall to parts of Wisconsin, life threatening cold air will cover the state this week, setting possible record overnight lows of -15 to -25 with wind chills from -35 to -50. “I’m concerned about the safety and well-being of our residents as this major storm and bitter cold moves in,” Evers said. State offices remain open to the public and to all State employees. State agencies will follow their inclement weather policies. Northwest winds will make sub-zero lows feel as cold as minus-35 degrees. The state Department of Health Services wants you to take extra precautions. Last winter saw 38 people die from exposure in Wisconsin. Much of the state will see highs in the teens and some snow on Monday, but very cold temperatures will return after that. Parts of Wisconsin may be getting more snow than expected as a winter storm shifted overnight. National Weather Service meteorologist Phil Kurimski says heavy wet snow is set to blanket south central and south east Wisconsin. A section of the state from Madison and the Dells northeast to Green Bay will be getting anywhere from 6 inches to a foot of snow. Roads are going to be very hazardous heading into the evening commute. “As this thing ramps up, we could get some freezing drizzle before the better moisture gets in here and it all changes over back to snow,” says Kurimski. You should take your time getting where you’re going, and give yourself plenty of room around other drivers. Winter weather is headed towards parts of the state which have yet to see much of it. There’s a winter storm watch for Friday night into Saturday for much of southern Wisconsin. Snowfall amounts could range from 2 to 5 inches in the southwest to 4 to 8 inches in the southeast. Snow will be followed by bitterly cold temperatures for the weekend, with overnight lows below zero across most of northern Wisconsin, and dangerous wind chills. A rainfall milestone for Madison. For only the second time in history, the city has eclipsed 50 inches of precipitation in a calendar year. In a typical year, southern Wisconsin receives just over 34 inches of rain. Madison’s all-time wettest year was in 1881 with just under 53 inches of rain. Following Thursday’s rainfall, Madison has received fifty-point-zero-two (50.02) inches of rain in 2018. The first winter storm of the season is pushing into Wisconsin. Heavy snow is tracking all the way from the Dakotas into Wisconsin. Dan Miller with the National Weather Service in Duluth says that storm may dump up to a foot of snow in parts of northern Wisconsin. The southern half of the state can expect snow totals of a few inches, along with some slick wintry mix. As always, Miller reminds people to take it easy on the roads through the weekend, and to stay at home if they don’t need to travel.